Infinite Space III: Sea of Stars is a single-player science fiction roguelike set in the same universe as its predecessors, Strange Adventures in Infinite Space and Weird Worlds. Turn-based star map navigation is combined with a real-time combat system. Each game session is a complete adventure that you can finish in one sitting – but the game world is randomly generated and will only reveal a fraction of its secrets each time. Discovering new items, alien races and random events will keep you busy for years! To extend the game’s longevity even further, we encourage people to make mods and will even provide tools for it. Coming out nearly a decade after Weird Worlds, Sea of Stars brings the universe of Infinite Space to a new audience. Beyond the prettier graphics and great soundtrack, the game world is more alive than ever before with each alien race developing new technologies and improving their patrolling fleets as time passes. The combat system has also been completely re-thought with an intuitive interface that allows you to hold ships in reserve and react quickly to a changing situation. The game will be available on Steam and other portals on 29th of October, 2015. For discussion forums and announcements, check out our Steam Community! 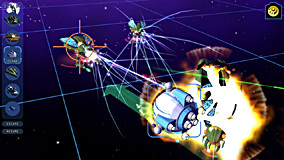 Infinite Space III: Sea of Stars was made possible in part by a successful Kickstarter campaign to pay for art, 3D modeling and the soundtrack. Thank you for your support! Infinite Space games © copyright 1999-2015 Digital Eel. All rights reserved.